Note: click here for a PDF of a printable version of this relatively long entry, which is also cross-posted on Inside Higher Ed. The Universitas 21 ranking of national higher education systems has been developed to highlight the importance of creating a strong environment for higher education institutions to contribute to economic and cultural development, provide a high-quality experience for students and help institutions compete for overseas applicants. 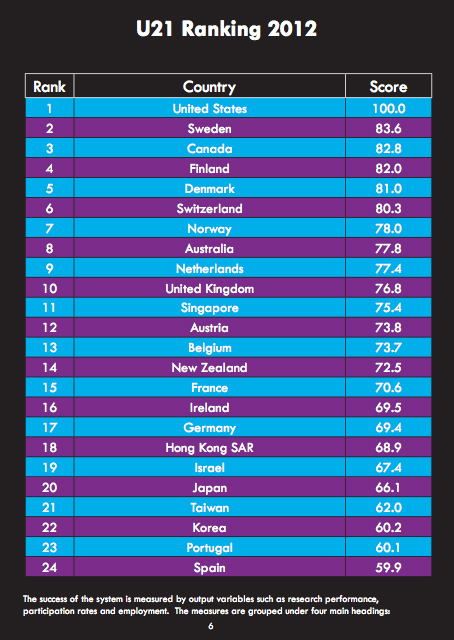 A screen grab of the top 24 countries, on the basis of this assessment, is pasted in to the right, and you can download a 28 page PDF of the ranking report here. Two informative commentaries on this rankings initiative were produced over the last few days by Ellen Hazelkorn and Alex Usher. Now, methodological questions aside, it is always worth asking the questions why has a ranking been produced, and how does the ranking fit into the sponsoring organization’s mission and modus operandi. As I’ve outlined here numerous times, many world university rankings are mechanisms to extract freely provided data from universities, which is then transformed into tables, graphics, analyses, websites, etc., that generate attention, advertising, and fuel for income-generating services provided by private firms like QS and Thomson Reuters. But the Universitas 21 ranking of national higher education systems is different. First, they are not attempting to extract data from universities as their analysis is framed at the national scale. Second, they primarily drew upon publicly available data to produce their rankings. And third, Universitas 21 is an international consortia of 23 universities (as at 2012), a rare if not lonely bird when it comes to rankings. My guess, and this is just a guess, is that Universitas 21 is reworking its mission, and the associated suite of objectives and activities to implement this mission. I used to work as a faculty member at the National University of Singapore (a founding member of Universitas 21) and in the early 2000s discussions of rankings were nowhere to be seen in Universitas 21-linked meetings; it was all about human mobility, nascent discussions of generating revenue via online learning, and ways to encourage collaborative research. The sanctioning of a new ranking, taken at the May 2011 President’s Meeting of Universitas 21, highlights that it is indeed a new activity; one well suited for the ‘attention economy‘ we are situated in. While I won’t comment here on the value of the Universitas 21 ranking of national higher education systems, or of the emergence of yet another higher ed ranking, I do think it is a timely reminder of the value of rethinking the missions and activities of international consortia (sometimes deemed networks) of universities. As Heike Jöns and Michael Hoyler have pointed out in various talks, consortia like Universitas 21 and the Worldwide Universities Network (WUN) emerged in the late 1990s and early 2000s, the heyday of the dot.com boom era (remember that?! ), a period when universities were exploring new mechanisms to competitively further their internationalization agendas (while simultaneously being seen to be doing so). Interestingly, several of them had early hopes to capitalize on the emergence of for-credit online education as a potential revenue stream. Smaller, younger, and more exclusive than the national (e.g., Association of Universities and Colleges of Canada), regional (e.g., Association of African Universities), postcolonial/linguistic (e.g., Agence universitaire de la Francophonie; Association of Commonwealth Universities), and global (e.g., International Association of Universities) associations of universities, these international consortia/networks of universities were formed to bring together a group of peers (or almost peers) where some put forward a view that ‘you are only as strong as your weakest link.’ The logic was to bring together like-minded universities to engender deeper and more concentrated forms of collaboration that were impossible on a bilateral 1-1 basis as well as at larger national, regional, or global scales. These consortia, as originally envisioned, were not mechanisms for capacity building (e.g., on a North-South university to university basis); instead they were mechanisms to enable the carefully selected members to become more than the sum of their parts, so to speak. Inviting the world in—from brilliant hiring to attracting the top international students—cannot of itself create the critical mass of talent that’s needed to solve fundamental global problems. We need partners. We must collaborate, not only with other universities but also with community groups, civil society organizations, industry, and government. A prompt, to be sure, that international consortia like Universitas 21 and the Association of Pacific Rim Universities (both of which UBC belongs to) need to have their missions and associated mechanisms for implementation debated about, while member universities also need to consider what expectations can realistically be made of the consortia they participate in. A blossoming of international collaborative degrees, many fueled by the largesse of the European Commission, the emergence of the European Higher Education Area, and also the desire of universities in Pacific Asia, South Asia, and Latin America to partner up at North-South and South-South levels. The creation of massive open online courses (MOOCs) designed to further easily accessible (and often free) lifelong learning opportunities. Completion of the courses sometimes includes the acquisition of a certificate versus a formal credit towards a degree. This model is a sharp contrast to the early online agenda of the international consortia formed in the late 1990s and early 2000s. See, for example, Coursera, Course Hero, edX, Khan Academy, MITx, OpenClass, Udacity, Udemy, many of which were established in 2011 and 2012. The emergence of professional master degrees and “new credit programs that serve non-traditional student populations,” many of which are designed to generate retained revenue for intra-institutional units (departments and schools). These schemes, though, are often targeted at very national if not regional (e.g., state/province) audiences. Austerity-related budgets in many national funding councils, which has reduced the opportunity to acquire healthy large-scale research support. In such a context, ‘hitching your wagon’ via an international consortia to other universities in relatively resource rich contexts is unlikely to generate significant, if any, gains. The emergence of project-specific international consortia to develop both low and high profile experiments in higher education (e.g. Applied Sciences NYC, est 2012; Center for Urban Science and Progress, est 2012) as well as defacto consortia associated with buildings and programs in select cities (e.g., Singapore’s Campus for Research Excellence And Technological Enterprise (CREATE)), or even universities (e.g., both Saudi Arabia’s KAUST and Kazakhstan’s Nazarbayev University were brought to life on the back of temporary international consortia of universities). The emergence of institutionalized disciplinary-specific networks (e.g., Global Network for Advanced Management, est. 2012) and deep partnerships (e.g., the Wharton-INSEAD Alliance, est. 2001). Deep partnerships that bring together 2-3 universities to facilitate enhanced coordination and integration of teaching, research and service functions (e.g., the Monash-Warwick Alliance, est. 2012). The establishment of intra-national networks or associations of universities that act as explicit or defacto ‘entry points’ for relations with foreign universities, funding councils, scholarship agencies and the like (e.g. CALDO a consortium of the Universities of Alberta, Laval, Dalhousie and Ottawa). An emerging debate about the nature and value system underlying dominant forms of internationalization, including a concern that internationalization is a process “bringing commodification, increasing the brain drain and potentially diminishing diversity in higher education” (see ‘Affirming Academic Values in Internationalization of Higher Education: A Call for Action‘). This debate links into internal consortia discussions (that go back to Day 1, really) about the tensions between a member-only peer-to-peer approach vs the idea of more inclusive and diverse institutional membership structures, with more heterogeneous global geographies. This is an interesting time for international consortia of universities. The consortia structure brings with it strengths and weaknesses. For example, it is large enough to enable the drawing in of complementary resources, people, skill sets, networks, etc. The scale of these consortia and the emphasis on peer-based membership structures also facilitates collaborative action on a number of levels. However, international consortia are also too large, in some ways, to facilitate rapid responses to opportunities. There is also a sense of equality in peer-based membership structures and this can preclude deeper partnerships between 2-3 members of a larger consortia. Add in the challenge of how to engender international research collaboration, as alluded to by Stephen Toope above, where you try to “foster the conditions in which it will happen naturally,” international teaching collaboration, and the collective provision of some forms of infrastructure, and you begin to see a rather complicated array of forces, dynamics, and actors to manage: all more reason for regular and open critical engagement about the purpose and value-added of international consortia and associations. To facilitate further discussions about the mission/activities question, I have pasted in (see below) the missions of the international consortia, networks, and associations that I know of. I’ve listed this information in reverse chronological order, in part to see what the newest consortia, networks and associations have decided to focus upon. If you know of any others that I have missed, please email me <kolds@wisc.edu> and I’ll add them here. Please keep it in mind, though, that some of these missions are evolving as I write, and the websites I link to are variable in quality and how up-to-date they are. ps: my sincere thanks to a large number of people (too many to mention here) who provided very helpful leads and insights about this topic. The mission of the UGPN is to develop sustainable world-class research, education and knowledge transfer through an active international network of selected Universities collaborating in research, learning and teaching to benefit global society. The MNU has been established to enable the universities to enhance diversity, to share ideas and expertise, and to learn international best practice from each other, recognising the shared commitment to an ethos of excellence in research, scholarship and rounded education. The WC2 University Network has been developed with the goal of bringing together top universities located in the heart of major world cities in order to address cultural, environmental and political issues of common interest to world cities and their universities. By promoting closer interaction between universities, local government and business communities, WC2 will help to create a forum where universities can be more responsive to the needs of their stakeholders in the context of world cities. The Global Alliance is a multilateral partnership of equals intended to strengthen education in the liberal arts and sciences. Specifically, The Global Alliance’s strength derives from expertise and experience sharing, and its emphases on the challenges and opportunities facing institutions that educate graduates for citizenship and leadership in the highly-globalized twenty-first century. The Network of Networks (NNs) is the idea of comprehensive network linking existing networks of universities and research institutions, which enables cooperation that will more effectively utilize the respective strengths of its members. By increasing opportunities for high-level joint research projects and student exchanges among members of existing networks, the NNs aims to provide a framework for the development of a new, integrated base of scientific knowledge leading to solutions to complex global challenges. The International Research Universities Network (IRUN) is an international network of broad-based research universities. The universities participating in the Network are well known for the international quality of their research and education, and are strongly motivated to improve that quality even further. The aim of IRUN is to further improve the quality of research and teaching at the universities involved. Within the Network, the exchange of researchers, lecturers and students will be encouraged and facilitated. On October 11th, 2007, a new International Forum of Public Universities (IFPU) was created. Limited to some twenty-five establishments, the Forum brings together public universities covering a vast array of contemporary knowledge, establishments that are recognized within their country for the importance they afford to research and their close ties to the development of society. The founding universities members are from Europe, Asia, Africa, South America and North America. The office of the general secretariat of the Forum is located at Université de Montréal. The IFPU answers a need that is not being met by any existing university group. The Forum promotes the expression of values that underlie the mission of public universities in an era of internationalization. The Forum will assist in the creation of new models of cooperation in education, teaching and research. According to common themes reflecting the issues faced by public universities, the Forum will promote education and research actions between establishments by calling upon the professor-researchers of member establishments and their post-graduate students. Some twenty highly reputed public universities from four continents teaming up in the discovery and transmission of new knowledge is certainly timely responsible. IARU members are leading research universities that share a global vision, similar values and a commitment to educating future world leaders. On 14 January 2006, IARU members signed a memorandum of understanding to engage in various activities including summer internships, research collaborations, benchmarking best practices, and identifying shared or common positions on key public issues. As the Alliance is small in nature, the members share a close-knit relationship. The Talloires Network is an international association of institutions committed to strengthening the civic roles and social responsibilities of higher education. We work together to implement the recommendations of the Talloires Declaration and build a global movement of engaged universities. Globalization of research and education activities requires that higher education itself becomes a global knowledge-based enterprise, seeking to build bridges across boundaries of diverse cultures and academic disciplines. Universities must ally with one another to create innovative research and educational advantages. on four related academic disciplines: Marine Affairs, Global Logistics, Business Administration, and Advanced Technologies. All GU8 members strive to advance worldwide knowledge in these areas of common expertise. We pursue excellence, focus on sustainability and responsible leadership, and impart these values through our students, researchers and partners. The vision of AC21 is the promoting of cooperation in education and research between members, the bridging between different societies in the world and the delivering of wisdom to all people to mutually understand and share values, knowledge and cultures necessary to improve quality of life and to foster co-existence beyond national and regional boundaries in the 21st century. Created in the fall 2002, the Alliance Program is a non-profit transatlantic joint-venture between Columbia University and three French prestigious institutions, The École Polytechnique, Sciences Po and the Université of Paris I Panthéon Sorbonne. Alliance is an innovative program whose aim is to initiate and accompany new initiatives in the fields of education cooperation, research collaboration, and policy outreach. The League of European Research Universities (LERU) was founded in 2002 as an association of research-intensive universities sharing the values of high-quality teaching in an environment of internationally competitive research. the promotion of research across a broad front, which creates a unique capacity to reconfigure activities in response to new opportunities and problems. The purpose of the League is to advocate these values, to influence policy in Europe and to develop best practice through mutual exchange of experience. Developing partnerships in higher education and research between Europe and the rest of the word in order to strengthen the position of European universities in a global context. The Worldwide Universities Network comprises 19 research-intensive institutions spanning 6 continents. Our mission is to be one of the leading international Higher Education networks, collaborating to accelerate the creation of knowledge and to develop leaders who will be prepared to address the significant challenges, and opportunities, of our rapidly changing world. Develop and administrator an on-line, census, and customized version of the SERU survey of first-degree students for international research universities, parallel to the SERU Surveys in the US. Conduct research on the student experience, sharing best practices via SERU meetings, symposiums, and joint-research projects intended to inform and drive institutional self-improvement in undergraduate education and broaden our understanding of the socioeconomic impact of these institutions. Collaborate with SERU-AAU Consortium members in the generation and sharing of institutional, comparative, and longitudinal data on the student experience, including SERU surveys of students, and based on agreed data sharing protocols. At the beginning of this century there was a strong need to establish new bases for a sustainable global society, taking into account environmental limits, re-examining the dynamics of global economic, political, human, social and cultural models, as well as their local manifestations. In fact we are currently experiencing a crisis of civilization, in which we must facilitate the transition towards a paradigm shift aimed at rebuilding society, with the collective desire and responsibility of attaining a better world for future generations. This is significant enough to warrant a discussion on what the role of higher education and its social contract should be in this new era, to reinvent an innovative and socially committed response that anticipates and adds value to the process of social transformations. These changes are mostly related to the review of the educative purpose, the role of knowledge in society to address major global issues, local needs in a global context and the need to prepare people to be global actors of positive transformation of societies. This requires reconsidering what the social contribution of higher education should be. GUNi encourages higher education institutions to redefine their role, embrace this process of transformation and strengthen their critical stance within society. To face these challenges, the mission of GUNi is to strengthen higher education’s role in society and contributing to the renewal of the visions, missions and policies of higher education’s main issues across the world under a vision of public service, relevance and social responsibility. The IDEA League, founded in 1999, is a network of five leading universities of technology and science. Our joint activities in education, research and quality assurance, as well as our joint participation in EU programmes and initiatives make us a model of European cooperation. Together, we create added value by pooling resources for collaborative and complementary programmes for our students, researchers and staff. To achieve its aims UNICA articulates the views of member universities to European institutions and to national, regional and municipal governments. It provides members with information on European initiatives and programmes, and supports them in co-operative projects. It also provides a forum in which universities can reflect on the demands of strategic change in university research, education and administration. The Association of Arab and European Universities (AEUA) was initiated in 1998 by the Lutfia Rabbani Foundation in The Netherlands. Its prime objective is to facilitate and to stimulate collaboration between universities in European and Arab countries at an institutional, departmental and faculty level. Ultimate goal is to develop human resources and promote understanding between cultures and exchanges between the civil societies involved. The leading global network of research-intensive universities, working together to foster global citizenship and institutional innovation through research-inspired teaching and learning, student mobility, connecting our students and staff, and wider advocacy for internationalisation. APRU aims to promote scientific, educational and cultural collaboration among Pacific Rim economies. In both its objectives and guiding principles, APRU embodies a commitment to global academic and research standards. APRU recognizes that its activities can be powerful catalysts for expanding educational, economic and technological cooperation among Pacific Rim economies. The association seeks to promote dialogue and collaboration between academic institutions in the Pacific Rim so that they can become effective players in today’s global knowledge economy. The Association of East Asian Research Universities (AEARU) is a regional organization founded in January 1996, with the goals of forming a forum for the presidents of leading research-oriented universities in East Asia and of carrying out mutual exchanges between the major universities in the region. Expectations are that this regional union, on the basis of common academic and cultural backgrounds among the member universities, will contribute not only to the development of higher education and research but also to the opening up of a new era leading to cultural, economic and social progress in the East Asian region. The general objective of the AUN is to strengthen the existing network of cooperation among universities in ASEAN by promoting collaborative study and research programmes on the priority areas identified by ASEAN. The specific objective is to promote cooperation and solidarity among scientists and scholars in ASEAN Member Countries; to develop academic and human resources in the region; and to produce and transmit scientific and scholarly knowledge and information to achieve ASEAN goals. The Consortium for North American Higher Education (CONAHEC)’s primary mission is to foster academic collaboration among institutions, organizations and agencies of higher education in Canada, Mexico and the United States. CONAHEC also promotes linkages between North America and higher education entities around the world. The Compostela Group of Universities (CGU) is a large, prominent, open and inclusive network of universities whose overarching goal is to facilitate and promote cooperation in the higher education sector. It achieves this by acting as a platform to foster and support projects among its members as well as by participating in activities as an entity in its own right. AUALCPI primary purpose is to promote cooperation between universities in the region with the aim of promoting the integration of the Commonwealth of Latin America and the Caribbean through collaborative activities and construction of a permanent space for discussion on integration and its relationship to education. The Santander Group is a European Universities Network comprising almost 40 members from 16 European countries cooperating closely to strengthen their individual potential as they strive for excellence in university governance, teaching and research approaches. The Santander Group is based on mutual trust, understanding, and respect for cultural diversity, which makes the network an open forum for exchange of experience and best practices in the strategic areas for the higher education system in Europe such as quality assurance and academic mobility. Thus, the Network plays an essential role in realisation of the Bologna Process objectives. The association also encourages contacts between universities and their surrounding communities on matters related to social and technological improvements, which makes it a reliable and strong partner for regional development. The Asociación de Universidades “Grupo Montevideo” (AUGM) is a network of public universities, autonomous and self-governing, of Argentina, Bolivia, Brazil, Chile, Paraguay and Uruguay. It is a civil non-governmental non-profit organization whose main purpose to promote the integration process via scientific, technological, educational and cultural cooperation between all its members. To foster universities’ influence in the development of lifelong learning knowledge and policies throughout Europe. A central player in the development of Knowledge & Innovation Communities in Europe. The Agence universitaire de la Francophonie (AUF) is one of the most important higher education and research associations in the world. The AUF has also been La Francophonie’s operating agency for higher education and research since 1989. This Francophone project aims to establish a French-language international academic community that produces and transmits knowledge. Columbus is a non-profit organization, founded by the European University Association (EUA) and the Association of Latin American Universities (AULA). Since 1987, Columbus has promoted cooperation between universities in Europe and Latin America. Its consolidated network of higher education institutions and university administrations allows directors to identify and implement institutional strategies to respond to new challenges. meeting the needs of business, industry and government through the development and sharing of resources, information and expertise. Founded in 1985 and formally constituted by Charter in 1987, the Coimbra Group is an association of long-established European comprehensive, multidisciplinary universities of high international standard committed to creating special academic and cultural ties in order to promote, for the benefit of its members, internationalization, academic collaboration, excellence in learning and research, and service to society. It is also the purpose of the Group to influence European education and research policy and to develop best practice through the mutual exchange of experience. Founded in 1980, the Inter-American Organization for Higher Education (IOHE) was created to respond to the needs of developing international relations, improving the quality of information, and promoting academic collaboration among Higher Education Institutes (HEI) in the Americas. The IOHE is the only university organization that spans the entire continent of the Americas. The IOHE is a not-for-profit organization whose objectives are primarily educational. This is achieved by: establishing collaboration among universities of the Americas; promoting understanding and mutual support; contributing to the sustainable development of the peoples of the Americas and respecting the free discussion of ideas. Assisting and coordinating the efforts of Arab Universities to prepare capable persons who can serve their Arab communities and preserve its unified culture and civilization, as well as to assist in developing its natural resources. The Association of African Universities is an international non governmental organization set up by universities in Africa to promote cooperation among themselves and between them and the international Academic community. 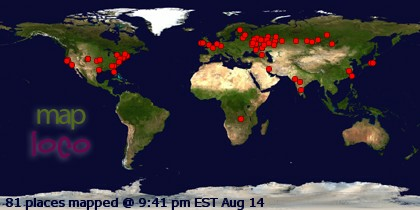 IAU: Building a Worldwide Higher Education Community. IAU, founded in 1950, is the UNESCO-based worldwide association of higher education institutions. It brings together institutions and organisations from some 120 countries for reflection and action on common concerns and collaborates with various international, regional and national bodies active in higher education. Its services are available on the priority basis to Members but also to organisations, institutions and authorities concerned with higher education, as well as to individual policy and decision-makers, specialists, administrators, teachers, researchers and students. The Association aims at giving expression to the obligation of universities and other higher education institutions as social institutions to promote, through teaching, research and services, the principles of freedom and justice, of human dignity and solidarity, and contributes, through international cooperation, to the development of material and moral assistance for the strengthening of higher education generally. The tolerance of divergent opinion and freedom from political interference. Promoting regional integration, defending the autonomy of universities, boosting the quality and social relevance of higher education. Working with our members to promote and contribute to the provision of excellent higher education for the benefit of all people throughout the Commonwealth. Editors’ note: several weeks ago, Professor Nigel Thrift, Vice Chancellor of the University of Warwick, UK, contributed an entry where he posed: ‘A question (about universities, global challenges, and an organizational, ethical dilemma)’. Peter N. Stearns, Provost of George Mason University, offered the first response to Nigel’s challenge in a series we will be posting through to the end of 2010. This ‘response’ is from Gregor McLennan, Professor of Sociology and Director of the Institute of Advanced Studies, University of Bristol. As Director of the IAS, Gregor has been busy promoting a series of debates around the changing nature of the university in contemporary societies. His contribution to this series is therefore particularly welcome. 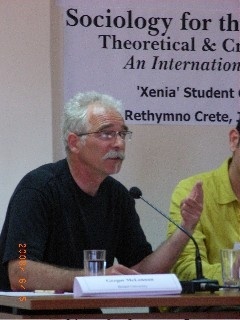 Gregor’s work lies in the area of sociological theories and social philosophies, and has written widely on Marxism and pluralism in particular. His book, Sociological Cultural Studies: Reflexivity and Positivity in the Human Sciences, tackled some key questions of the day around (inter) disciplinarity, explanation, critical realism, complexity theory and Eurocentrism. I want to raise a couple of issues about Nigel Thrift’s questions, to do with the way he constructs universities as a collective agency, a coherent ‘we’ that bears a ‘global’ identity. Nigel urges this ‘we’ fully to bring its actions into alignment with its ‘beliefs’, and to improve upon the shoddy performance of ‘other actors’ in tackling the ‘grand challenges’ of the day. And in that regard, the collectivity should see itself henceforth as positioned on a ‘war footing’, deploying its ‘engines of reason’ to force the principles of ‘scientific cooperation’ into service of the ‘survival of the species’. There are several things that might be contested in this scenario of ‘agentification’, by which I mean the portrayal of universities as though they constituted a singular moral centre or personality, strategically intervening as such. One is to do with its assumed site, the ‘global’ apparently designating something definite, and something quite obviously good. As Nigel knows, substantial objections can be raised against such easy affirmation of the nature and ‘imperativity’ of the global per se. Yet universities everywhere now are falling over in the rush to assure themselves that meeting the ‘challenge of the global’ is something wholly other than the imperativity of the market, something that instead touches upon our deepest ethical and intellectual mission. It behoves us, I think, to be a tad sceptical about such ‘globalloney’ (in Bruno Latour’s phrase), and perhaps even to risk the accusation of parochialism by emphasising the continuing importance of the national contexts that not only universities, but many millions with an interest in the future of universities, still mainly orientate themselves around. National contexts – arguably at least – retain a certain logistical, cultural and psychological coherence that globality might forever lack; and the prospect of a world of relatively small-scale, highly educated democracies looks better geared to effective species-survival than the sort of flaccid but pushy cosmopolitanism that is currently doing the rounds. Second, it is not self-evident that the kind of cooperation that characterizes scientific practice and development has any direct application to, or analogue within, the political processes through which any humanity-wide survival strategy will necessarily have to be coordinated. Nigel asks universities as a whole to interact in the way that individual investigators do, but this expectation is surely inappropriate. Academics are driven to work together because of their motivation to produce facts, measures, truths, and theories, whereas universities, as such, have no such intrinsic motivation, and nor do governments. So asking universities to tackle the survival of the species is rather like asking families, or football clubs to do this. It’s not that people within these civic associations shouldn’t be mightily concerned about such imperatives, and contribute their expertise in a politically active way. It’s just that this is not these institutions’ defining concern. Indeed, in some ways the specific concern of universities – to develop plural communities of knowledge and understanding through discovery, controversial systematization, and rigorous reflection – is likely to generate some resistance to any politicized summary of the ‘threats and opportunities’ that ‘we’ all face. Don’t get me wrong, this is not a defence of the apolitical: as individuals and members of a range of collectives, we should get active around the priorities that Nigel Thrift designates. But it might be OK that universities are not best suited to organize in that targeted way. As Peter Stearns emphasises, universities’ hallmark medium is education, which is necessarily open-ended, changing and reflective. Of course, just as we need universities to free us from the blockages of our societal formations, interests and mind-sets, so in turn we need politics to reign in our deliberations and give positive shape to our values. But though they complement each other in this way, the functions of education and politics remain very different. The third problematic aspect of Nigel’s line of thought comes out most clearly in Indira V. Samarasekera’s paper in Nature, in which it is suggested that universities have two prevailing thought-styles and labour processes: ‘solution-driven’ and ‘blue skies’. Both modes, she accepts, have to be part of core business. But whilst the latter, ‘until recently’, has been considered the ‘mainstay’, and must ‘remain so’, a much closer alignment between the two modes is held to be necessary if ‘we’ are to be more effective in ‘solving the world’s problems’. Accordingly, it is quite a good thing that the ‘fairly traditionalist’ structure of ‘curiosity-driven projects’ is giving way to a ‘fast and effective’ modality, enabling us to ‘keep pace’ with the big challenges, for which we need to ‘copy the organizations that work best’. To that end, Samarasekera maintains, we need to develop ‘collaboratories’ involving universities, government and industry, to bridge the gap between ‘universities and the private sector’, and to construct funding regimes that stimulate ‘interdisciplinary, inter-professional, and inter-sectoral approaches’. It strikes me that the founding contrast here between ‘blue skies’ thinking (with just a hint of the smear of ‘uselessness’) and various other research practices (themselves over-schematized as ‘solution-driven’) is considerably exaggerated. But another, perhaps more insidious, bifurcation comes into play, according to which the agentic ‘we’ of the university turns out to have two bodies, as in, ‘We, the academic leaders and universities, should embrace this new relationship…’ In this depiction, the purely academic side of the collective, and the blue skies folks in particular, are ushered into the background and cast as worryingly slow off the mark, not quite up to the demands of fast and smart global Higher-ed with its solution-seeking culture. Responsibility for meeting the latter therefore falls perforce to the academic leaders, now stepping decisively into the foreground as the distinctive group that represents the essence and future of the university. So, given that the merits and deficits of, let’s say, inter-disciplinarity are never going to be definitively resolved if left to the bottom-up logic of seminar-room agonism, university leaders will have to push it through from the top, along with all the other excellent and necessary ‘inters’ of the new knowledge-society regime – inter-sectoralism, inter-professionalism, dynamic and agile Engagement with dynamic private and civic Collaborators, and so on. Now, whilst Nigel’s notion of the ‘forcing’ of knowledge seems potentially more subtle and interesting than this increasingly hectoring management ideology, a somewhat ‘traditionalist’ note still needs to be struck by way of caution, because to see universities as agentic interventionists at all is to risk missing the central point and purpose, even today, of their existence. The global higher ed world is associated with a variety of novel initiatives that mix and mingle players operating at a range of scales, while forging and deepening new networks. The rationale and timing for each of these initiatives varies, of course, as does each initiative’s potential for “success” when it comes to the implementation phase. This report was commissioned by UK Prime Minister Gordon Brown in the Spring of 2008, and was completed in January 2009 (though not released until today). In a future entry I will examine the content of the report, and put this content (and the report’s development process) into greater context. 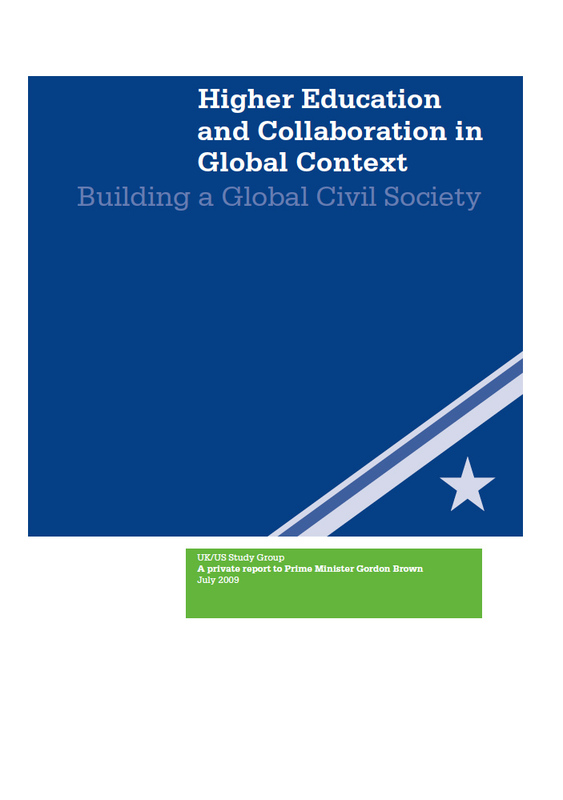 For now, though, see below for a copy of the summary of the report, link here for the press release, and link here (Higher Education and Collaboration in a Global Context) for a copy of the full report. This report makes the case for a new model for UK/US collaboration, one that will develop multilateral partnerships and bring the longstanding UK/US partnership in higher education to bear in third locations. It argues that if the UK and the USA are to continue to assert their primacy in the realm of higher education (HE) within an increasingly competitive global context, they will best do so collaboratively. The emergent global HE picture represents a challenging but ultimately promising framework for newly-envisioned UK/US collaboration. Now, more than ever, collaboration across borders among our leading universities is absolutely necessary. The strength of the UK/US partnership, the longstanding preeminence of the two countries in the HE sector, and, more recently, the unfolding of the global economy, validate the case for deepened – and internationalised – collaboration. Furthering the UK/US collaborative HE relationship can no longer have as its sole goals mobility and partnership between the two, nor the advancement only of UK and US interests. The biggest challenge ahead is to focus on ways of extending the UK/US model to third locations. This will enrich immensely the universities of both countries, foster the growth of an open, competitive and accessible HE sector in other nations, and constitutes a vitally important form of soft diplomacy and power. Most critically, it will foster – if framed by ambitious initiatives – the development of a ‘global civil society’ which will bind universities and countries together through common values and principles, and counter the centripetal forces of the globalised era. The report provides an account of the origins and purpose of the group that produced it; assesses the history of UK/US higher education partnership, its strengths and weaknesses, and current context; and gives a forecast of developments with which the partnership must engage. Most critically, it makes a case for the absolute centrality of higher education in this emerging world, and provides ideas that capitalise on that centrality and begin to orient the longstanding UK/US partnership toward the globalised world before us for the creation of a global civil society. Finally the decision on who has won the European Commission’s million euro tender – to develop and test a global ranking of universities – has been announced. The successful bid – the CHERPA network (or the Consortium for Higher Education and Research Performance Assessment), is charged with developing a ranking system to overcome what is regarded by the European Commission as the limitations of the Shanghai Jiao Tong and the QS-Times Higher Education schemes. The final product is to be launched in 2011. Will this new European Commission driven initiative set the proverbial European cat amongst the Transatlantic alliance pigeons? As we have noted in earlier commentary on university rankings, the different approaches tip the rankings playing field in the direction of different interests. Much to the chagrin of the continental Europeans, the high status US universities do well on the Shanghai Jiao Tong University Ranking, whilst Britain’s QS-Times Higher Education tends to see UK universities feature more prominently. CHERPA will develop a design that follows the so called ‘Berlin Principles on the ranking of higher education institutions‘. These principles stress the need to take into account the linguistic, cultural and historical contexts of the educational systems into account [this fact is something of an irony for those watchers following UK higher education developments last week following a Cabinet reshuffle – where reference to ‘universities’ in the departmental name was dropped. The two year old Department for Innovation, Universities and Skills has now been abandoned in favor of a mega-Department for Business, Innovation and Skills! (read more here)]. The basic approach underlying the project is to compare only institutions which are similar and comparable in terms of their missions and structures. Therefore the project is closely linked to the idea of a European classification (“mapping”) of higher education institutions developed by CHEPS. The feasibility study will include focused rankings on particular aspects of higher education at the institutional level (e.g., internationalization and regional engagement) on the one hand, and two field-based rankings for business and engineering programmes on the other hand. The field-based rankings will each focus on a particular type of institution and will develop and test a set of indicators appropriate to these institutions. The rankings will be multi-dimensional and will – like the CHE ranking – use a grouping approach rather than simplistic league tables. In contrast to existing global rankings, the design will compare not only the research performance of institutions but will include teaching & learning as well as other aspects of university performance. The different rankings will be targeted at different stakeholders: They will support decision-making in universities and especially better informed study decisions by students. Rankings that create transparency for prospective students should promote access to higher education. Testing will take place next year and must include a representative sample of at least 150 institutions with different missions in and outside Europe. At least six institutions should be drawn from the six large EU member states, one to three from the other 21, plus 25 institutions in North America, 25 in Asia and three in Australia. There are multiple logics and politics at play here. On the one hand, a European ranking system may well give the European Commission more HE governance capacity across Europe, strengthening its steering over national systems in areas like ‘internationalization’ and ‘regional engagement’ – two key areas that have been identified for work to be undertaken by CHERPA. On the other hand, this new European ranking system — when realized — might also appeal to countries in Latin America, Africa and Asia who currently do not feature in any significant way in the two dominant systems. Like the Bologna Process, the CHERPA ranking system might well find itself generating ‘echoes’ around the globe. Or, will regions around the world prefer to develop and promote their own niche ranking systems, elements of which were evident in the QS.com Asia ranking that was recently launched. Whatever the outcome, as we have observed before, there is a thickening industry with profits to be had on this aspect of the emerging global higher education landscape. Note: this presentation, and associated discussion paper (in English), were produced for the International Association of Universities (IAU) 3rd Global Meeting of Associations of Universities (GMAIII), Guadalajara, Mexico – 20-22 April 2009. Link here for French and Spanish versions of the same discussion paper. The ‘European Quality Assurance Register’ for higher education: from networks to hierarchy? Quality assurance has been an important global dialogue, with quality assurance agencies embedded in the fabric of the global higher education landscape. These agencies are mostly made up of a network of nationally-located institutions, for example the Nordic Quality Assurance Network in Higher Education, or the US-based Council for Higher Education Accrediation. Since the early 1990s, we have seen the development of regional and global networks of agencies, for instance the European Association for Quality Assurance in Higher Education, and the International Network for Quality Assurance Agencies in Higher Education which in 2007 boasted full membership from 136 organizations from 74 countries. Such networks both drive and produce processes of globalization and regionalization. The emergence of ‘registers’–of the kind announced today with the launch of the European Quality Assurance Register (EQAR) by the E4 Group(ESU, The European University Association – EUA, The European Association of Institutions in Higher Education – EURASHE, The European Network of Quality Assurance Agencies – ENQA) – signals a rather different kind of ‘globalising’ development in the sector. In short we might see it as a move from a network of agencies to a register that acts to regulate the sector. It also signals a further development in the creation of a European higher education industry. …provide clear and reliable information on the quality assurance agencies (QAAs) operating in Europe: this is a list of agencies that substantially comply with the European Standards and Guidelines for Quality Assurance (ESG) as adopted by the European ministers of higher education in Bergen 2005.
serve as an instrument to improve the quality of education. All Quality Assurance Agencies that comply with the European Standards and Guidelines for Quality Assurance will feature on the register, with compliance secured through an external review process. There will also be a Register Committee – an independent body comprising of 11 quality assurance experts, nominated by European stakeholder organisations. This committee will decide on the inclusion of the quality assurance agencies. The EQAR association, that operates the Register, will be managed by an Executive Board, composed of E4 representatives, and a Secretariat. The ‘register’ not only formalises and institutionalises a new layer of quality assurance, but it generates a regulatory hierarchy over and above other public and private regulatory agencies. It also is intended to ensure the development of a European higher education industry with the stamp of regulatory approval to provide important information in the global marketplace. 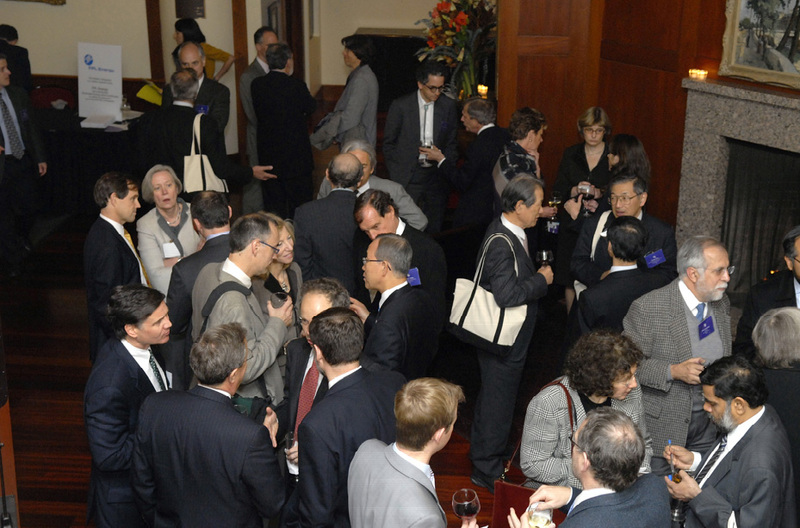 The Global Colloquium of University Presidents: events for global challenges? University presidents (or their equivalents – vice-chancellors, rectors), especially those associated with universities that seek to be at the forefront of the internationalization/globalization agenda, are searching for suitable mechanisms to make their voices heard, create momentum for change, and generate discursive effects at a wide variety of scales. In other words university presidents seek material change (e.g., enhanced understanding of issue X; new initiatives to address problem Y) but they also seek to use such mechanisms to create positive publicity for their university (under their stewardship) as leaders at a global scale. Leadership at the local, state/provincial, and national scales is no longer enough for ambitious university presidents. Thus a rescaling process is taking place with an enhanced emphasis on the global, with universities as seeking to act as global actors and university presidents seeking to act as global leaders. In some ways this is nothing new, as the experience of colonial university vice-chancellors and rectors demonstrated. Such people acted as the interlocutors between the colonizer and the colonized; the soft administrative infrastructure and centres of calculation that enabled colonial networks to be extended over space. This said times have changed, and it is interesting to see what forms of action are emerging in the contemporary era, where these forms of action are initiated, where they take place, and what the underlying objectives are. International university consortia and associations are one key mechanism, be they inclusive or exclusive. One example of the inclusive is the very active Paris-based International Association of Universities/Association Internationale des Universités, which has 570 members. The IAU/AIU runs or sponsors numerous events that bring together senior university officials, including presidents, to discuss and debate issues of global relevance. As Lily Kong also noted on 7 October, international consortia such as the Worldwide Universities Network (WUN), or the International Association of Research Universities (IARU) also create events (many of which are of an annual nature) that bring together senior officials, usually university presidents, to discuss issues. They sometimes focus on substantive issues, such as at the recent Realising the Global University conference, though many of such events tend to be focused on consortia governance matters. Regular and ad-hoc groupings of university presidents are also brought together by national councils and associations but their ambit is national in scope is therefore limited by statute, in general. In this context, the third annual Global Colloquium of University Presidents took place at New York University (NYU) a few weeks ago. The first two of these events were held at Columbia University (2005), and Princeton University (2006). A core group of university presidents (Amy Gutmann, University of Pennsylvania; John Sexton, NYU; Lee Bollinger, Columbia University; Richard Levin, Yale University; Neil Rudenstine, president emeritus of Harvard University; and Shirley Tilghman, Princeton University) are the formal sponsors of the Global Colloquium of University Presidents. One of the first speeches I gave on taking office as Secretary-General was to a distinguished group of university presidents from around the world. From the outset, I was convinced that universities would be tremendously important partners of the United Nations. And so it has been. As educators, as repositories and creators of knowledge, as people deeply involved in helping the world address the issues of our times, your role has been vital. This colloquium is yet another example of the productive ties we have developed over the years, and I hope it will become a tradition. The third Global Colloquium of University Presidents appears to have drawn in a larger and more diverse set of university presidents, as the attendee list demonstrates (Bangkok University, Columbia University, El Colegio de México, Fudan University, Harvard Universit, Hebrew University of Jerusalem, Indian Institute of Technology, Karagpur, Institut d’Etudes Politiques de Paris-Sciences Po, Jawaharlal Nehru University, Kyoto University, Makerere University, New York University, Pontifical Catholic, University of Rio de Janiero, Princeton University, Seoul National University, Tsinghua University, University of Amsterdam, University of Botswana, University of British Columbia,, University of Dhaka, University of Oxford, University of Pennsylvania, University of São Paulo, University of Tokyo, Yale University). It also drew in the new Secretary General (Ban Ki-moon), with Bill Clinton as a guest speaker this particular year (hard to imagine GWB as a guest speaker in future years…). NYU is, as we have noted, pushing the boundaries with respect to the globalization process so this event would clearly have been viewed as a complement to action on other levels for this institution. Are these events more than networking opportunities? It is difficult to say at this stage. Is, for example, the cumulative knowledge base of all of these universities regarding climate change evident in the position papers available here and here (with late stragglers consigned to the late download site here)? Or are the position papers mere leaders to bridge scholars in a president’s university to relevant UN units? I can’t answer these questions, nor will I pose more that could be asked. But what I can say is that we at GlobalHigherEd have noticed a restlessness as universities (and select university leaders) seek to identify what networks and scales to focus their activities and contributions on, and how to frame their identities (and their brand names). All universities are embedded, placed, grounded; they have territorially specific responsibilities to the societies that they depend upon and (hopefully) nurture. But how to blend these responsibilities with supra-national responsibilities and objectives is becoming a conceptual and strategic challenge. Are temporary or regular fora such as the Global Public University, the Globally Engaged Institution, and the Global Colloquium of University Presidents the answer? Or are member-only international consortia of universities the answer given their capacity to offer sustained dialogue? Or is active and sustained leadership via a body like the International Association of Universities/Association Internationale des Universités the answer? There are numerous other options, many of which have not been discussed or indeed even invented yet. The point is that we are only at the early stages of thinking through what role universities, and university presidents, should be doing with their limited time and resources so as to address pressing process-oriented challenges that cut across the divisions that so artificially constrain truly global analyses and the formulation of associated solutions. If universities are to become genuine global actors, then more sustained thinking, and acting, on an intra-organizational level, is required. But we also need a broader global view, with an eye to creating a more effective and inclusive global landscape of options that is appropriate for universities and their leaders. 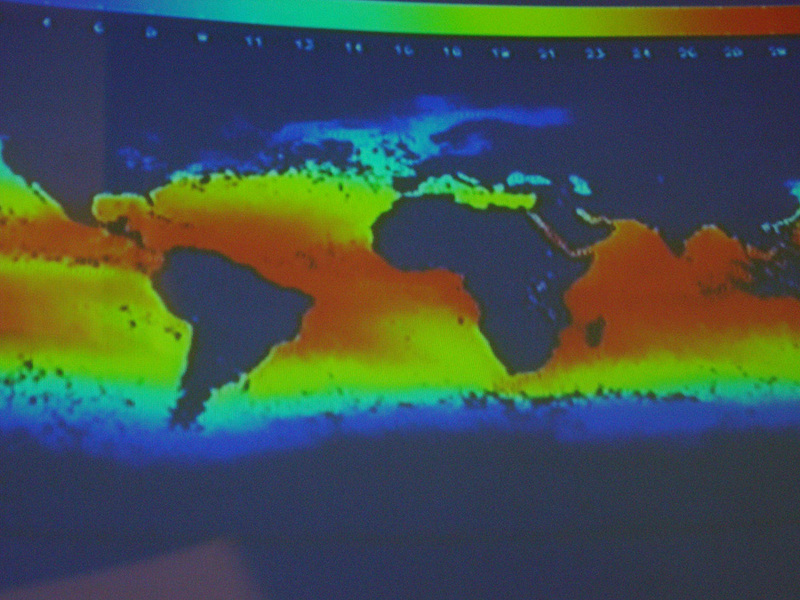 Update: The next Global Colloquium of University Presidents is being held at Yale University in January 2010. Link here for the press release.